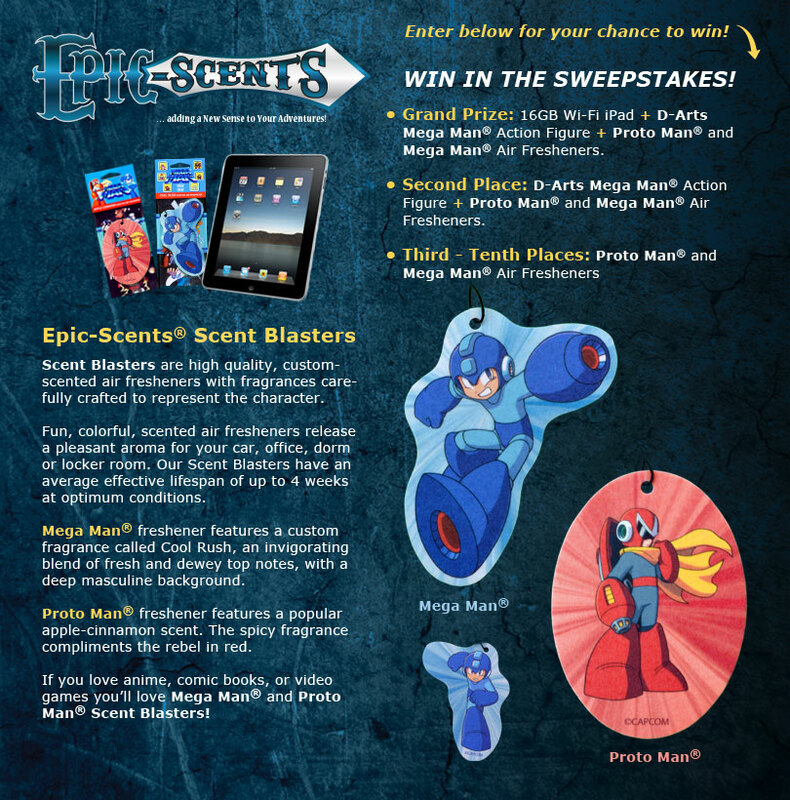 To enter the sweepstakes, simply fill in the appropriate information at Epic-Scents' Facebook page. Entries will no longer be accepted after November 2nd, 2012. I'm still a little bewildered by the whole fragrance crossover thing. Still, those are some mighty tantalizing prizes. Who's going to pass that up? I wonder if the first-place winner gets to choose which D-Arts figure they get, or if it's randomized. You know, I thought the same thing, Joseph. Mega Man is probably Blueberry scent and Proto is probably Cherry. I must add, I got a few ideas for more "Obvious" scents with characters from the X Series that I posted on Capcom-unity & Epic-Scents pages. So I figured I'd Share them here too ^__^. -Optic Sunflower from MegaMan X8 with a Sunflower scent. -Cinnamon from MegaMan X Command Mission with Cinnamon scent. -Axle the Red (Spike Rosered) From MegaMan X5 with Rose scent. -Tornado Tonion from MegaMan X7 with an Onion scent. 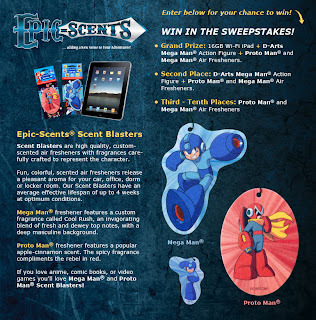 You'd better hope that they don't release a "Ground Scaravich" scent, if Mega Man X themes are done. I hope that these don't just smell like fruit. The new car is the way to go. It's the only thing that fits with the characters. Lastly, Protodude, The Mega Man Network just posted some info on the 25th Anniversary Rock/Techno Soundtracks from TEAM Entertainment Inc.
Hi everyone! Jim from Epic-Scents here. A quick background, I grew up playing Mega Man, and never really stopped as I got older. There's a couple of great articles on our Facebook page that describe how we designed the fragrances. We tried hard to capture the characters in the scents we used to represent them. I'd like to encourage everyone to let us know what products you'd like to see, and what you think of our products on our Facebook page. Feel free to start up a dialogue or ask questions as well! We have certainly seen a lot of suggestions for Mega Man X characters and the inclusion of Bass. This is an exciting project for us, and I'm glad to see a thread of comments on our products. Thank you to the Rockman Corner for posting our sweepstakes, and good luck everyone!